Tramadol is an opioid painkiller used to treat chronic pain. 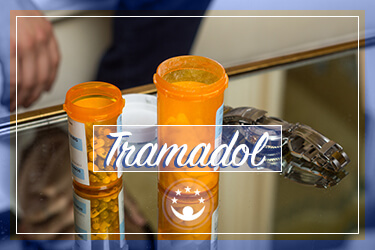 When taken as prescribed, this medication is ingested every 4-6 hours; however, people who struggle with tramadol addiction may take it more often and at higher doses. Doctors adjust prescription doses so their patients do not consume more than 400 mg of tramadol per day. More than this amount can cause severe side effects, including addiction, tolerance, and dependence. Per the National Library of Medicine, in a double-blind study regarding the general side effects from tramadol, about 26 percent of people taking the medicine as directed developed diarrhea; 24 percent experienced nausea and vomiting; 18 percent had headaches; and 16 percent experienced excessive fatigue. Other side effects, like vomiting, itching, and sweating, occurred in less than 10 percent of study participants; dry mouth, indigestion, and diarrhea occurred in about 5 percent of study participants. These are very rare when tramadol is taken as directed; however, people who struggle with addiction to this narcotic may experience these side effects. Some people may develop an allergy to tramadol, and this can cause symptoms like hives, difficulty breathing, mouth sores, rash, itchy eyes, and even convulsions. While this is rare, symptoms should be reported to doctors for emergency treatment immediately. If too much vasodilation occurs, blood pressure will drop, and the person may faint, suffer damage to the heart and blood vessels, and potentially experience organ damage, including brain damage from lack of oxygen. People who abuse tramadol are at risk of suffering an opioid overdose. If a person survives opioid overdose, they may suffer liver failure, although this could be associated with taking acetaminophen at the same time as the narcotic. It is rare for opioid painkillers like tramadol to cause liver damage, but it has occurred in a small percent of cases. Tramadol may also increase the risk of serotonin syndrome in people who take antidepressants, including SSRIs. It is unclear how this occurs, but it appears that tramadol enhances the effects of the antidepressant on releasing serotonin and preventing it from being reabsorbed. This causes serotonin to remain in the brain for too long. Many cases of serotonin syndrome clear up on their own, but very serious instances can cause high fever, irregular heartbeat, unconsciousness, or seizures.